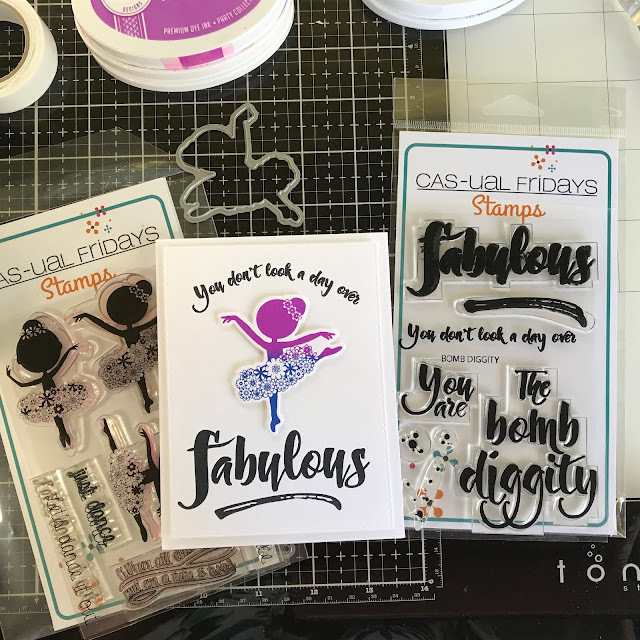 CAS-ual Fridays Stamps: You don't look a day over Fabulous! Hi everyone, Michelle W here today and I'm so excited to be joining you with my first post as a new Ink Squad DT member. I have two cards to share with you today using the Tutu and Bomb Diggity stamp sets. These cards came together quite quickly which is my favourite kind of card! 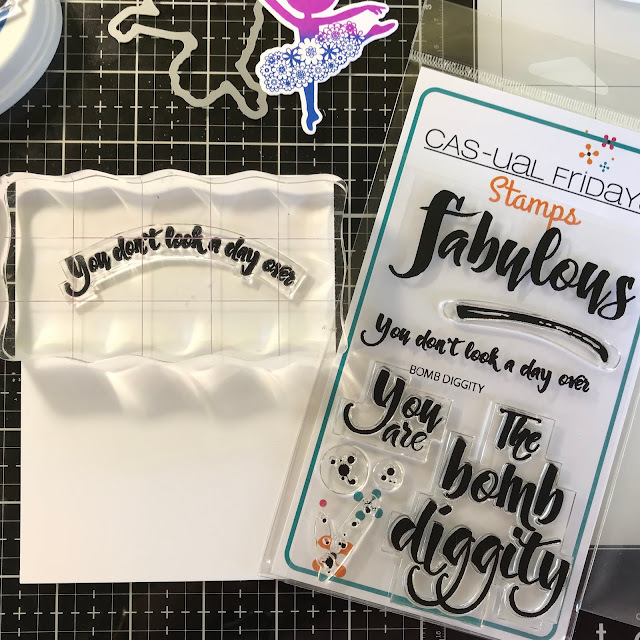 My style tends to be more on the CAS side as they seem to appeal to me more and partly because I don't like to spend a lot of time making one card, perhaps you could call me a lazy stamper! 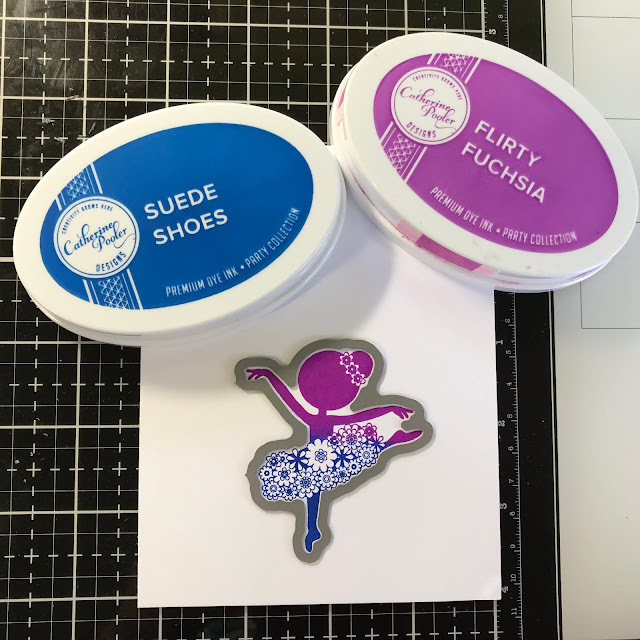 First I stamped the ballerina from "Tutu" stamp set using two different coloured inks and die cut her out using the coordinating Ballerina Fri-Dies. For the sentiment, I curved the "you don't look a day over" from "Bomb Diggity" stamp set onto my block and stamped it onto the top of my card panel. Then I stamped the "Fabulous" at the bottom. Finally I adhered the ballerina onto my panel using dimensional foam squares and adhered that panel onto my card base using some foam tape for a bit more dimension. And here's my second card which is basically the same but I stamped the ballerina out in the one ink colour and then coloured the flowers in her hair and tutu with my Prisma colour pencils. I sponged the edges of the card base with the same coloured ink and adhered the panel straight onto the card base. 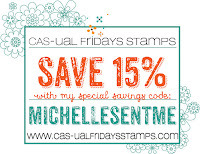 Here's a link to the stamp sets and Fri-Dies used on my cards and if you would like to purchase them, you can use my code below to get a 15% discount!! Very pretty card Michelle!! Congrats on your first solo post here on CAS-ual Fridays!